A little bit of the U.K is heading to U.S.A, Pasadena to be exact! ToyCon Uk’s Mascot the mighty TOYCONOSAURUS aka T-CON is ready to seek mayhem at Designer Con as the lads at Ko-Re Ko-Re will be bringing the T-CON Flaming Chrome Fire Lizard Edition. Super limited amount made in a classic kaiju colour scheme another cop to look out for if you’re lucky to be at Dcon next week. 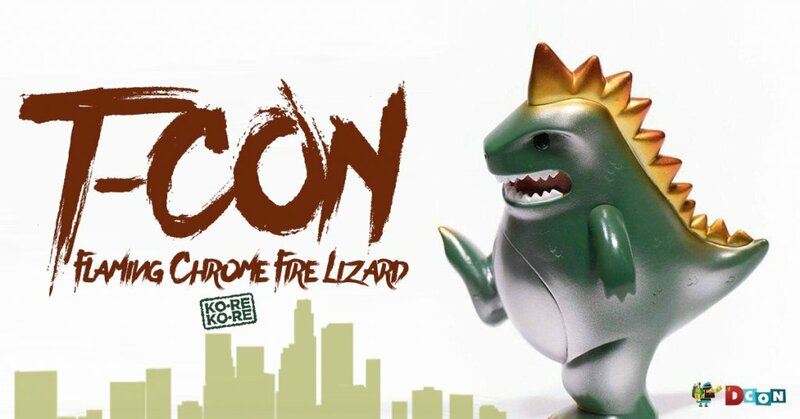 T-CON Flaming Chrome Fire Lizard Edition will be available at the Ko-Re Ko-Re booth #1031 in ltd numbers.